It happens to me every year around this time. The weather gets warmer, the days are longer, the mind begins to go in vacation mode and the craving for a summer break begins. As a native Italian, specifically from Calabria, the vacation craving usually involves a trip back to my homeland. Many things draw me back to my native place of birth; family, of course, the vibrant oceans that rival those of any Caribbean island, and the cuisine is certainly a reason in itself for a return trip. 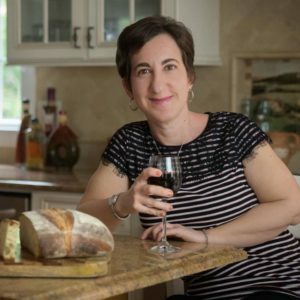 To say that Italian cuisine is one of the most popular cuisines out there is an under statement, but what many may not realize is just how regional Italian cooking actually is. Every region has its own specialty dishes and Calabria is no exception. Rich in history, culture, and agriculture, Calabria is in the Southern portion of Italy, the toe of the boot-shaped country. It’s rural, non-touristy and less pretentious than some of the Northern regions. Its cuisine is spicy, exciting and not for the faint of heart! Freshly picked figs of two varieties. Due to its geographical location, Calabria inhabitants enjoy a bounty of seafood, particularly swordfish, cod and sardines. The hilly terrain makes it an ideal location for pigs, lambs and goats to roam around, and as such pork is the protein of choice with lamb right behind it. The strong sun and hardy soil make for an ideal environment to grow an abundance of produce and tomatoes, eggplants, zucchini and their blossoms and fava beans are just a few of the regions most widely favored vegetables. Mushrooms are also a popular byproduct of the region, porcini being a widely found variety. 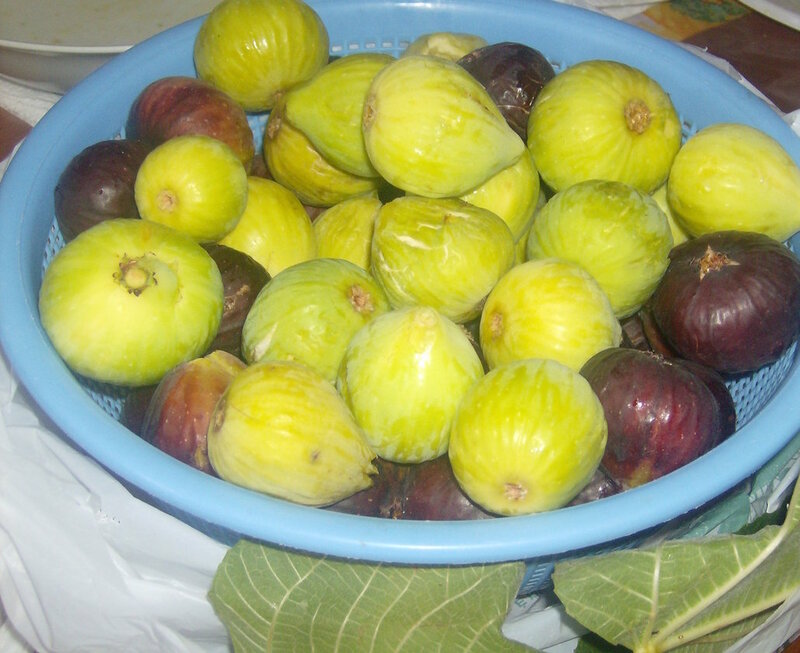 Fig trees are also plentiful and their sweet fruit is just right for eating in the summer months. The region is also one of the top oil-producing territories in the country and the oil is not only used for cooking, but many of these vegetables get preserved in the oil for the winter months. Stewed eggplants, peppers and mushrooms are ideal for preserving “sott’ olio,” literally, under oil. 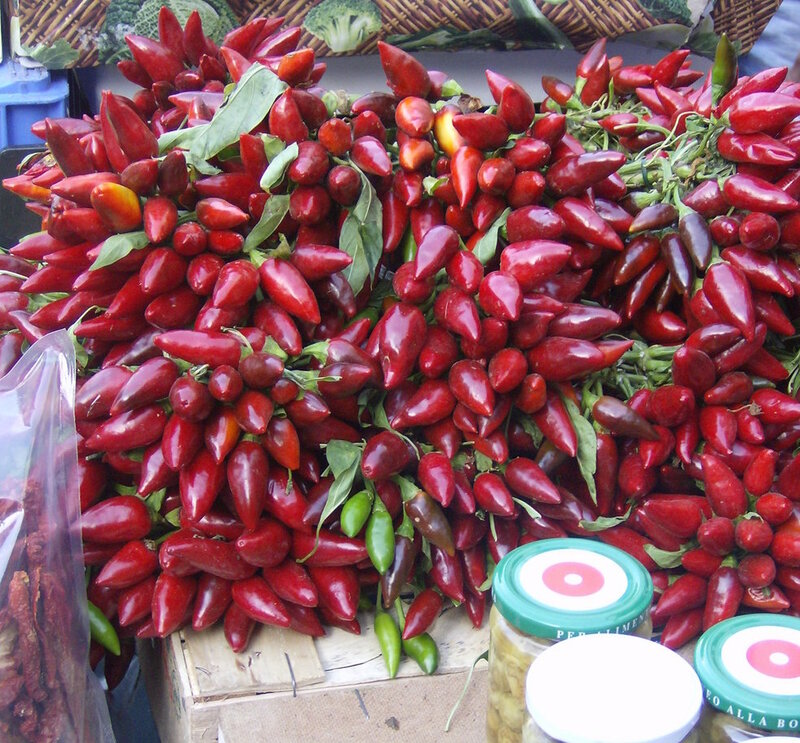 No Calabrian meal is complete if not topped off with the region’s famous peperoncino. Whether fresh, dried, whole or crushed, rarely is a meal made without some form of this spice. Famous throughout the country and varying in heat intensity, Calabria’s chili peppers are practically a food group of their own. A table would be considered incomplete without a few fresh chilis on it. Sagre, or food festivals, are specifically devoted to this spice and it is here that you will find various dishes with peperoncino as a main ingredient from pasta, to meats and even gelato. You will find many sagre in Calabria, especially in the summer months. Some of the most popular ones include festivals in honor of swordfish, mushrooms, olive oil and wine. Many can be appropriate for families. 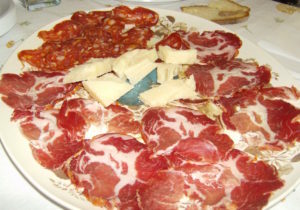 Sulumi, or cured pork products, are also very prevalent in Calabria. Utilizing two of their most widely found ingredients, pork and chilis, Calabria boasts a wide selection of salami products. 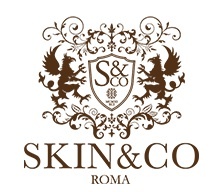 This method of preserving food is widely accepted in the area, and unlike many other regions in Italy or even the world, most salumi produced in Calabria are all natural as only natural ingredients are used in the curing process. 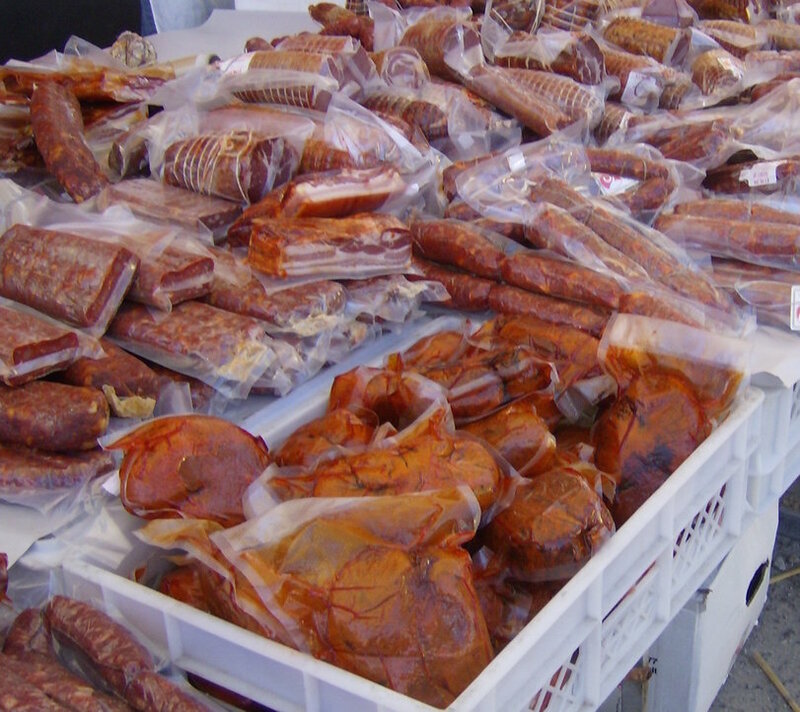 From soppresata Calabrese to capicolla, none is probably as authentically Calabrian as ‘Nduja. Nduja is an extremely spicy soft pork product that is spreadable and very fiery. It pairs well with regionally made cheeses and wine and is an ideal spread on freshly made pitta. Pitta is a regionally made bread, round and with a hole in the center, it is found in small bakeries and specialty shops. Pasta is eaten daily in Italy and in Calabria the homemade version is generally made only with semolina flour and water, where as in the Northern portion of Italy, whole eggs or egg yolks are added. Homemade pasta is generally reserved for special occasions and the many forms of dried verities are most commonly used during the week. Condiments for pasta dishes include the many varieties of vegetables, tomato sauce made using fresh tomatoes, beans, legumes or pork. Pasta al forno, a traditional Calabrian dish of baked pasta dressed in homemade sauce made with ground meat and with fresh mozzarella, salami, hard-boiled eggs and ham is also a widely prepared Sunday dish. 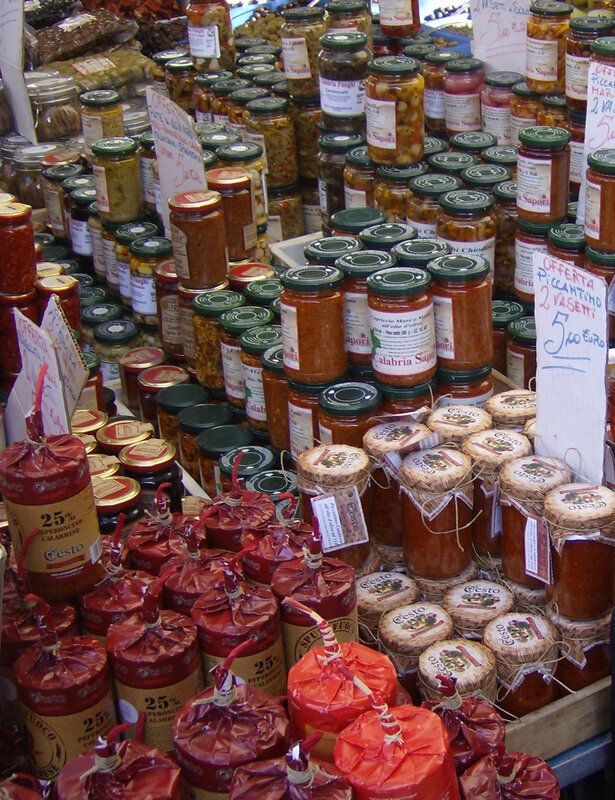 Provola and peperoncino displayed proudly in an open door market. 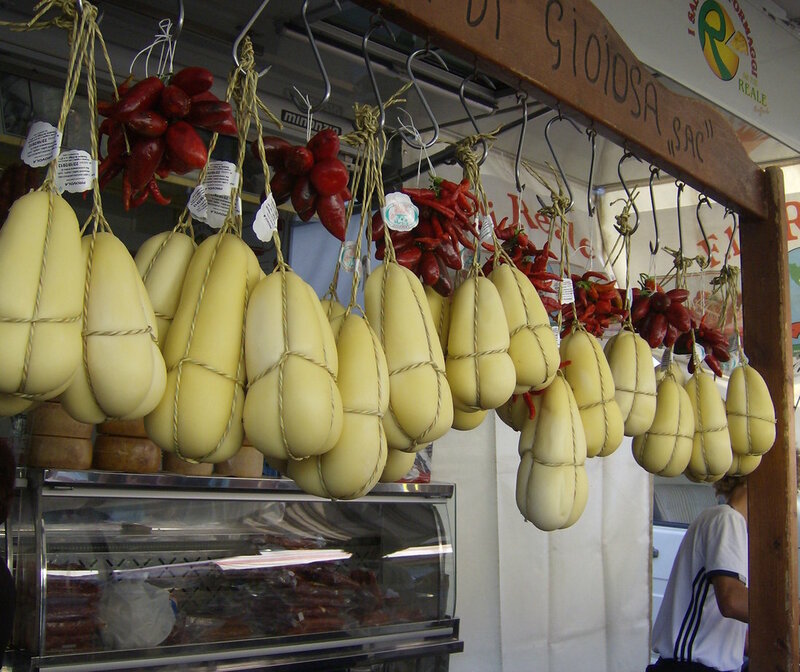 Calabria possesses a wide selection of cheeses made with both cow and sheep’s milk. One of the most famous ones is pecorino Calabrese. Made from sheep’s milk, pecorino can be eaten semi-soft and un-aged and once it’s diced or sliced it makes for a great accompaniment to an antipasto platter. It can also be left to age a bit and dry. Once dried and grated, it can resemble Parmesan cheese and used in dishes in the same matter as Parmesan, though the flavor is very different. Provola is an unassuming cheese, mild in flavor and similar in texture to a hardened mozzarella. It makes a great addition to sandwiches and can be shredded and added to pizzas as it melts quite nicely. Of all the wonderful cheeses made in Calabria, none can compare to the freshly made ricotta cheese. I would go as far as to say that you’d have a hard time finding a better tasting ricotta anywhere else in Italy. It can be made with both sheep and cow’s milk, can be used in both sweet and savory dishes and is a very versatile cheese. Though wonderful added to any dish, the best way to fully taste ricotta is by itself. Just spread some over some warm bread and sprinkle some salt and you will be in cheese heaven. Ideally also topped with some homemade preserves for a delicious breakfast. 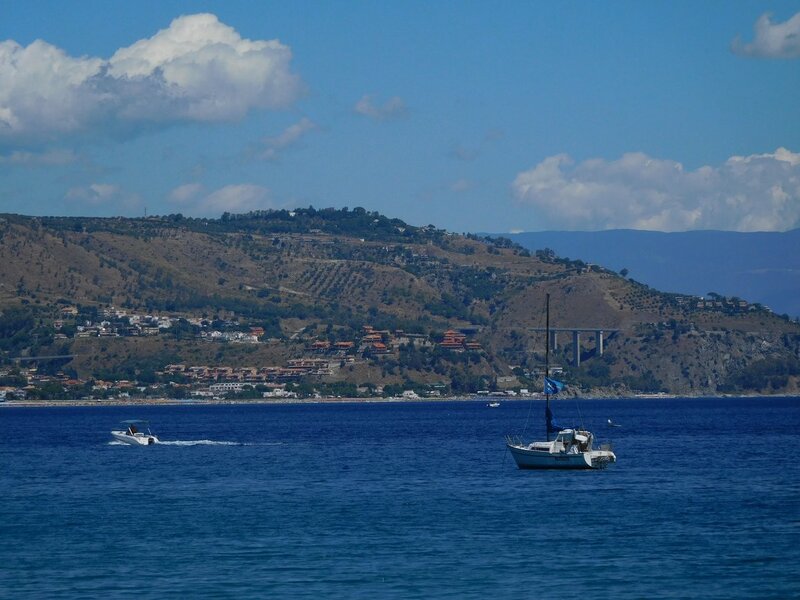 Surrounded with over 500 miles of coastline from the Ionian and Tyrrhenian seas, beautiful mountains ideal for hiking or to simply to enjoy a picnic and some of the country’s best cuisines, it’s no wonder I crave Calabria almost on a daily basis, particularly during the summer.